Of course, any experienced business leader recognizes that maintaining a consistent focus on each of these elements is a daunting task. I will provide additional details and guidelines on each of these best practices in future blog posts. Please contact me with questions and to share best practices from your own personal experiences in growing successful businesses. Editors Note: This is the second and final post in a two-part series examining the best practices that we have captured from utilizing an IP Asset Management (IPAM) database system to support our IP marketing and commercialization initiatives. 6. Adhering to your institutions technology guidelines. This posting will address the final three best practices in this area. Effective reporting capabilities assist your staff in increasing their personal productivity and should be a vital tool to assist your organization in achieving your specific goals and objectives. Well-designed reporting tools provide the ability to quickly and easily obtain status information on all aspects across your technology portfolio along with satisfying your management reporting requirements. Your reporting features should provide excellent visibility and transparency across your IPAM database solution to avoid a black whole scenario where you know the data is in there somewhere but you just cannot locate it no matter how hard you try. A business analytics software tool can provide your organization with a strategic advantage when you use the tool to assist in identifying trends and mine additional opportunities for licensing and partnerships throughout your portfolio that is captured in your IPAM database. Powerful reporting tools should also provide you with the foundation for effective project management to ensure that you are maximizing your deal potential and minimizing the surprises that you have to react to. Implementing a world-class IPAM database solution without proper training and support for your team will only result in frustrated and dissatisfied staff, inaccurate or incomplete information in the database, and negative impact on your organizations productivity. Effective training is planned and delivered at the right time, with the right amount, at the right level, and in the right place. High-tech web-based, multimedia tools can be very efficient and cost effective for training option for your staff and should be accompanied by a high-touch connection that includes mentoring from your senior staff members and system experts. What is the support process and the depth and qualifications of your support organization? What is the process to request enhancements and what is your track record for publishing new software releases? Are you using a users group or steering committee that includes customers to prioritize new features? Do you provide a forum with other IPAM system users to share best practices? Successfully commercializing a vast and diverse portfolio of technologies is a fundamental and often daunting undertaking for all technology transfer offices. World-class organizations seek out and capitalize on best practices within their offices and across the industry. We firmly believe that properly utilizing your IPAM database solution  while having the discipline to adhere to your processes and procedures  will have a positive impact on the overall success of your organizations technology commercialization initiatives. Editors Note: This is the first post in a two-part series examining the best practices that we have captured from utilizing an IP Asset Management (IPAM) database system to support our IP marketing and commercialization initiatives. During our many years of hands-on experience in generating scores of licenses and successful partnership agreements for clients since 2001, Fuentek has relied on an intellectual property asset management (IPAM) database to support our core marketing process. 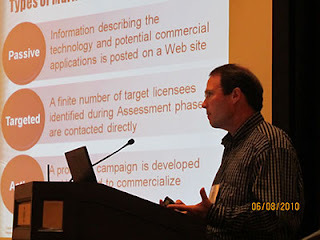 We have found that this database, along with a collection of other best practices for marketing IP, has played a key role in our success in the commercialization of innovations across a diverse array of technology categories for universities, federal government labs, and commercial companies. Maintaining an effective IP management database system positions your tech transfer organization to proactively monitor and manage your marketing initiatives and thereby get maximum value from your IP portfolio. A well-designed and successfully implemented IPAM database system facilitates communication, fosters collaboration, and is an invaluable tool to ensure consistent adherence to your licensing process. Each of the commercial and proprietary IPAM database solutions currently available have their inherent advantages and disadvantages. However, we have found that the crucial factor to achieving maximum value from whatever database system you choose is discipline. The value ultimately delivered from your IPAM database solution depends upon the entire organization diligently adhering to approved procedures and entering your IP-related data into your database in a consistent fashion. This posting will outline the first three best practices in this area. We have found that it is very beneficial to establishand have the discipline to maintainstandard attributes for each of the technologies within your IP portfolio. These standard taxonomies for categorizing and organizing your technologies are a key prerequisite for incorporating an effective search capability within your IPAM database solution. Our experience has proven that investing time up-front to appropriately classify your technology assets is a prudent investment. Ensuring easy access to all the elements within your technology portfolio enables your team to become more efficient while positioning your technology managers for more effective decision-making by fully capitalizing on your institutional knowledge captured in your database. Another critical feature within an IPAM database solution is a robust search engine that provides your staff with reliable result set with elements throughout your entire database, including all database fields and documents. Well-designed comprehensive search capabilities position your staff to mine information from your database and capitalize on lessons learned from your teams earlier actions and decisions regarding similar technologies. Of course, the overall effectiveness of your search engine is directly related to the diligence and consistency of the attributes that you use to describe and categorize your technologies (i.e. IPAM best practice #1). Additional benefits can be obtained by integrating at least a rudimentary level of workflow management within your IPAM database system to provide the foundation for efficient collaboration and communications across your organization. Your workflow solution should factor in how you can most efficiently manage the data and documents to support your technology transfer initiatives. Successful workflow solutions promote staff accountability, efficiency, and timely results. In my next blog posting, I will elaborate on the next three best practices for using an IPAM database to support your IP marketing efforts. Has your organization attempted to capture and institutional best practices in managing your IPAM database? Lets take a closer look at Platform. Your TTO can greatly improve efficiency and effectiveness by leveraging modern, low-cost, readily available technology solutions such as IP asset management database applications, calendaring and scheduling, instant messaging, websites, e-mail marketing, Web conferencing, blogs, wikis, microblogging, and other social media tools. It is important that the tools you deploy are intuitive and not overly complex, helping rather than hindering your staff in performing their jobs effectively. Your platform of technology solutions should also be as synergistic as possible to maximize the productivity of your TTO associates. Has your office invested in technology solutions that support and encourage communication, collaboration, and teamwork throughout your office and across your institution? Do your tools facilitate workflow and project management? Do you know where each project currently stands and how much time has been invested in it? Do you have easy and intuitive access to your key databases, or have they become a black hole for your critical information? Can you retrieve the patent or marketing status in real time? How does your organization go about rating the overall effectiveness of your chosen technology solutions? Lets look at Process in more detail. STS proposes institutionalizing just enough process discipline throughout your TTO to improve your agility and efficiency, and to deliver consistent high-quality services within stated time and resource constraints. Process institutionalization requires a focused and conscious effort to define, document, communicate, and train your staff on key processes within your organization, such as a specific set of criteria that must be met for a start-up to license a technology or the license application forms used for all negotiations. Like the majority of management and leadership responsibilities, the concepts are rather straightforward but can be challenging to execute successfully. Have you developed standard templates to support your evaluation, assessment, marketing, and licensing processes? Do you provide all potential licensees with the consistent instructions, application forms, and base license agreement templates (with no specific business terms) when they request a license? Have you cultivated an internal culture that promotes feedback and continuous process improvement? Do you proactively consider the organizational impact that various changes may have across your operation? What procedures have worked for your organization to define, develop, implement, and institutionalize processes that improve the overall effectiveness of your organization? Leave a comment below, and check back next week for the last installment in this series. As outlined in the first post of this series, managing the people in your organization is critically important and may often be your most challenging responsibility. It requires a considerable effort to attract, recruit, and retain experienced and qualified professionals for all positions across your organization. Additional processes that are essential to building and maintaining an effective and efficient team include your on-boarding process, establishing mentors for new staff members, and developing the right sourcing strategy for personnel to support your mission. What key competencies are you missing today (from technical knowledge to negotiating skills) and what will you need in 6 to 12 months as your R&D organization grows or changes? How will you recruit associates with the appropriate skills and experience level, and what portion do you need fulltime versus on an as-needed basis? What personnel investments are you making to develop key organizational relationships across your institution? Are these relationships strong or do you need a different personality as your liaison? What investments are you making to improve your teams ongoing capabilities and competencies in order to impact your goals? How does your organization work on attracting, recruiting, and retaining key professionals to build a world-class TTO? Leave a comment below, and check back next week for the next installment in this series. How do you keep your staff focused and not distracted by lower priority tasks and initiatives that prevent your organization from achieving stated goals (i.e., licensing deals)? For the technologies you are actively marketing at this time, how many resources (time and funding) have you already expended and expect to spend before a deal is signed? Is the expected revenue stream from the deal greater than the cost? Do your operational metrics reflect progress toward achieving your institutional and TTO goals, or are you just capturing and reporting on readily available metrics? If you find that you are spending a disproportionate amount of time on activities that are not directly impacting your goals, you should consider re-evaluating the current set of goals to ensure they are appropriate for your organization, or re-distribute priorities and responsibilities to make sure those who should be driving your goals have the time and resources to do their jobs. Planning who should do what and for which projects is most important and will help your office focus its resources appropriately and achieve your goals more effectively. How is your organization implementing effective and proactive plans? Chime in with a comment below. Editors Note: This is the first in a five-part series examining STSs Deal-making 4 Ps. This overview will be followed by posts that focus on each P within this approach. 1. Planning. Effective planning includes establishing a strategy with supporting goals and plans that deliver the greatest return on investment (ROI) from limited resources. It is imperative to implement practices that position your organization to focus on delivering results in line with your institutions goals. 2. People. While it may be obvious that your goals should include attracting, recruiting, and retaining qualified professionals for positions within your TTO, the challenge of doing so can often be considerable. Additional key tactical and strategic details and procedures demand your attention, including your on-boarding process, establishing mentors for new staff members, and developing the right sourcing strategy for personnel to support your mission. 3. Process. Institutionalizing just enough process discipline (the extent to which you define and follow specific steps for activities) across your TTO will enable your office to be agile and efficient, positioning your organization to deliver consistent high quality services within stated time and resource constraints. Process institutionalization requires a conscious effort to define, document, communicate, and train your staff on key activities within your organization, such as evaluating commercialization potential and required documentation from prospective licensees before an agreement is signed. 4. Platform. Your TTO can achieve tremendous efficiency and effectiveness by taking advantage of modern, low-cost, widely available technology solutions. These tools include IP asset management database applications (from online invention disclosure submission to docket tracking to recording licenses), calendaring and scheduling, instant messaging, websites, e-mail marketing, Web conferencing, blogs, wikis, microblogging and other social media tools. It is important that the tools you deploy are intuitive and not overly complex and that they help rather than hinder your key professionals in performing their jobs effectively. What steps does your organization take to improve the effectiveness of converting disclosures into licensing and partnership deals? Chime in with a comment below, and be sure to check back over the next few weeks to learn more about how STS implements the 4 Ps. Karen Hiser and I had the pleasure of presenting Tech Transfer Marketing Concepts and Marketing Social Media Strategies at the AUTM Eastern Region Meeting in Atlanta on June 8. Both of our sessions were well attended and were extremely interactive, with the participants posing pertinent questions and sharing their personal experiences and challenges. The most enjoyable aspect of this conference was the interactions that both Karen and I had with participants throughout the conference on the challenges and opportunities facing higher education Technology Transfer Offices in 2010 and beyond. Is your Technology Transfer Office facing challenges securing licensing agreements for your patent portfolio? Please contact us to learn how we can assist. In my last posts, I discussed the value of social media tools such as blogs, with some extra discussion of microblogging, as an effective means of communication for Technology Transfer Offices (TTOs). Now I offer the following guidelines to position your organization to capitalize on the use of these two and other social media tools. Plan. Establish a plan that links the use of blogs, microblogging, and other social media tools to specific goals, objectives, and challenges within your organization. Establish metrics (hard and soft) to monitor the effectiveness of your use of these tools and their impact on your goals. Connect. Proactively expand and enhance your professional network on an ongoing basis. Tools like LinkedIn, Plaxo and even Facebook can assist you in identifying the right person at the right place at the right time that may be your next licensee or business partner. These tools are a natural extension of the relationships that you are continuously cultivating via professional associations and your internal interactions. Integrate. Become an active (rather than a casual) participant and establish accountability for doing so. Institutionalize your use of these tools, so that daily disruptions do not cause you to constantly put off these tools until tomorrow. Establish a schedule each day when you or a member of your staff is tending to the care and feeding of your social media platforms. Listen. Social media is extremely dynamic, with new trends, technologies, and applications emerging monthly. Observe the emergence of these new trends, capitalizing on new sources of information and professional relationships. And remember to listen to what others are blogging about that provide insights on new trends in technology commercialization and licensing of intellectual property. Engage. Identify opportunities for you and your organization to deliver value to your subscribers. You should continually seek opportunities to maximize the value they return to your organization. As you plan to leverage social media tools, think beyond the written word and your traditional communication methods. When feasible, take a multi-media approach, incorporating pictures, audio and video to represent your technology portfolio beyond a static Web site. Social media tools are clearly not a fad and will continue to evolve and improve as a key communications vehicle for organizations across the globe. If you have not already embraced these tools, I encourage you to dig in and begin your planning process. Are there any best practices that you can share from using social media tools to support your Technology Transfer Office?